Water cascades into this narrow canyon in the heat of summer, but in the winter the thundering falls freeze solid to create natural ice sculptures. Johnston Canyon is one of the most popular attractions in Banff National Park and has a network of steel catwalks built into the canyon walls that allows you to walk right along this cathedral of ice with airy views into the gorge below. As you do, you’ll get to wander through a natural cave to gaze down at the flowering waters of the lower falls. Continue onto the awe-inducing upper falls — a glittering tower of ice that rise 30 metres above your head. These gigantic pillars of ice are the tour highlight and ice climbers can often be seen scaling the frozen columns. This popular guided icewalk will lead you past the lower falls and on to view the breathtaking upper icefalls from the upper deck. You will also travel through prime wildlife habitat to reach the falls and learn the clues to how Johnston Canyon was formed. This tour is recognised as a Canadian Signature Experience – a collection of once-in-a-lifetime travel experiences found only in Canada. Travel through prime wildlife habitat on the way to the trailhead. Walk along the steel catwalks built into the canyon walls which allows a spectacular view down the canyon walls to the ice and river below. Gigantic pillars of ice are the tour highlight and ice climbers can often be seen scaling the frozen columns. There will be a small break so you can enjoy the scenery and take photos. The tour is 4 hours long which includes 2 – 2.5 hours for the icewalk. The 8:30am tour returns to Banff at 12:30pm, and the 1:30pm tour returns to Banff at 5:30pm. This half day tour includes transport to popular Johnston Canyon for a guided hike to see the frozen waterfalls. Guests will hike along snow and the steel walkways called ‘catwalks’ built into the canyon walls that give an airy view of the gorge below, and past the lower falls and to the breathtaking upper falls. Please note that this tour stays on the trail, and does not traverse the ice due to safety concerns. We provide ice cleats that will be attached to your boots that will prevent you from slipping on the ice. We also have hiking poles if you would like to use them for extra stability. Does the tour walk on ice? This tour does not walk on the ice (as it is fragile, dangerous and you can punch through to the icy flowing water). You will be following the trail and steel catwalks that are built into the canyon wall and allow a spectacular view down the canyon walls to the ice and river below. The steel catwalks are above the canyon, and vary in height from ground level up to about 10m (30 ft). The Icewalk is 5.4km (3.4 miles) and has an elevation of 135 metres (443 feet), with a total walking time of 2 – 2.5 hours. This icewalk is considered easy/moderate but it is the most difficult winter walk that we offer as the main elevation gain is done is short climbs (in some cases steep enough for steps), rather than being dispersed over the entire distance. Moderate fitness is recommended to ensure that you enjoy the tour. We provide ice cleats that will be attached to your boots that will prevent you from slipping on the ice, and we have hiking poles for extra stability if you would like to use them as well. 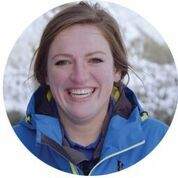 What is the difference between this day tour and the Evening Icewalk? The day and evening tours are different lengths of time, distance and elevation. The day tour is a 4 hour tour that includes both the lower and upper falls with 2 – 2.5 hours of walking and is a little more strenuous due to the increased distance (5.4km) and elevation gain of 135 metres (443 feet). 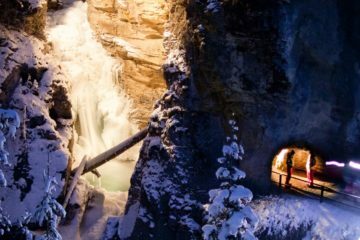 The Johnston Canyon Evening Icewalk is a 2.5 hour tour that visits the lower falls with 1.5 – 2 hours of walking 2.2 km with an elevation gain of 65 metres (213 feet) and includes a souvenir headlamp (yours to keep after the tour!) to light your way under the stars. 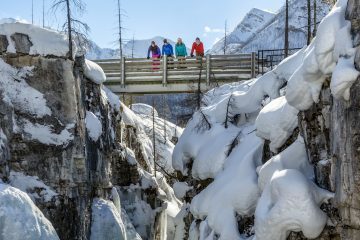 What's the difference between the Johnston Canyon and Grotto Canyon Icewalks? Johnston Canyon is one of the most popular attractions in Banff National Park, and has a network of steel catwalks built into the canyon walls that allows you to walk right along the frozen waterfalls (rather than directly on the ice). 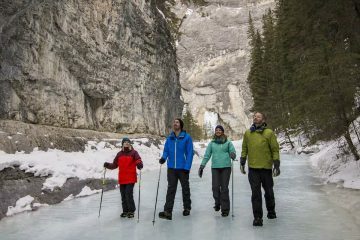 There are two Johnston Canyon Icewalk options, the daytime icewalk is a 4 hour tour that includes both the lower and upper falls with 2 – 2.5 hours of walking and is a little more strenuous due to the increased distance (5.4km) and elevation gain of 135 metres (443 feet). The evening icewalk is a 2.5 hour tour that visits the lower falls with 1.5 – 2 hours of walking 2.2 km with an elevation gain of 65 metres (213 feet) and includes a souvenir headlamp to light your way under the stars. On both Johnston Canyon Icewalks the walk is mainly up above the creek bed on a series of trails and catwalks. The Grotto Canyon Icewalk allows you to walk directly on a frozen creek bed at the bottom of Grotto Canyon past unusual rock formations, ancient Native rock art, and icefalls. The icewalk is 4.2km (2.6 miles) and has an elevation of 100 metres (328 feet), with a total walking time of 2 – 2.5 hours. This icewalk is generally considered easy, with a few small inclines. Snow pants are recommended for this tour and are mandatory if it is below -16C (3F). Otherwise on warmer days, jeans/regular pants over long johns are okay. Snow pants can be rented from stores in Banff such as Snowtips-Bactrax. A warm jacket. 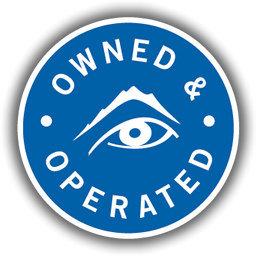 Ski jackets can be rented from stores in Banff such as Snowtips-Bactrax. Sturdy warm shoes, ideally winter boots or hiking boots. They do not have to be waterproof, but they must be warm. No heels, ugg boots, flip flops or sandals. If you do not have warm shoes, please contact our Reservations Team and we will check our stock levels or recommend a rental store such as Snowtips-Bactrax. Does it get icy? Can the tour be cancelled from the cold weather? It does get icy during the winter season which is why we provide ice cleats during the tour to give you extra grip while you are doing your icewalk. We cancel our tour at around -30 degrees Celsius or -22 Fahrenheit, and would offer to reschedule or refund your tour if this occurred.